Based on reviews from 10,032 users. 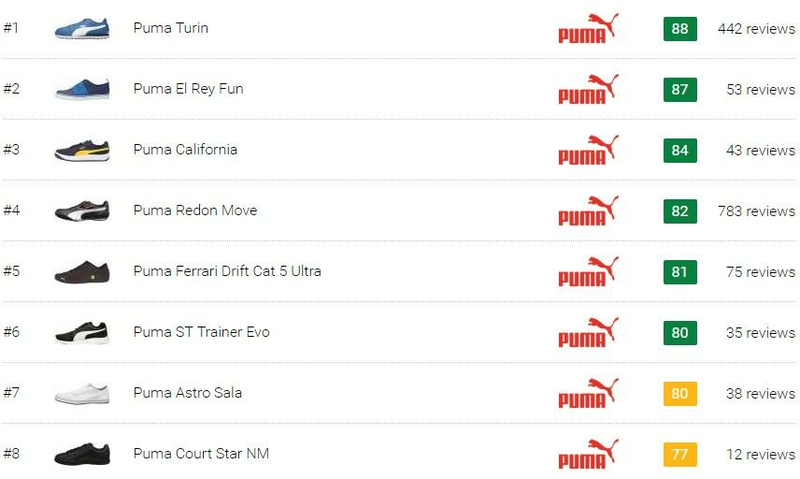 Learn how our rankings work or see our guide to Puma Classics sneakers. Updated Apr 2019. Long before sneaker culture boomed and evolved into its present state, Puma had already established a name for itself in the athletic footwear industry. Interestingly, the German sports brand shares a controversial piece of history with Adidas as it was founded out of a feud between brothers Rudi and Adolf Dassler. Together, they formed the Gebrüder Dassler Schuhfabrik or Dassler Brothers Shoe Factory, with Adolf designing the shoes and Rudi marketing them. But in 1948, they had a falling out and had to split the company. Adolf formed Adidas, while Rudi created Puma. With 70 years on and counting, Puma remains to be a brand that continuously makes such strong impact in the whole community of sneaker enthusiasts, collectors, and casual wearers as well as in different subcultures. There may have already been innumerable men’s Puma sneakers and women’s Puma sneakers that released in that span of time, but the famous Jumping Cat logo still shows no sign of going downhill anytime soon. A myriad of colorways like red, blue, black, white, pink, purple, beige, gold, green, brown, silver, and yellow are currently offered for different Puma sneakers. Puma sneakers are classified into two categories – Lifestyle and Sports. Under the Lifestyle category is a collection that focuses on the brand’s timeless classic silhouettes that have shared, in their own ways, a crucial part in shaping Puma into becoming a pillar of the sneaker industry that it is today. Puma Classics sneakers were initially designed as performance shoes for a particular sport, but with their popularity, versatility, and style, they eventually transitioned into being lifestyle sneakers. The Suede, Clyde, Basket, and Breaker models were originally basketball shoes. The Court and California models are inspired by tennis, while the Turin is a soccer-inspired model. Because of their athletic origins that root back to decades ago, most Puma Classics sneakers have a retro style. They are indeed classic, timeless, and the kind of footwear that never goes out of style. Most of these sneakers have a low-top profile, but there are still a few that follows a mid-top or high-top constructions. Sneakers in the Puma Classics collection, particularly recent releases, are upgraded versions of classic Puma shoes. Some of them are almost entirely identical to their respective core models, with just a minor design tweak or change of materials. Like any other classic sneakers from brands like Adidas, Keds, New Balance, Nike, Reebok, Vans, or Converse, Puma Classics sneakers vary in fit and sizing depending on the shoe model, construction, and materials or technologies used. Most Puma Classics sneakers are made in men’s and women’s sizing. Some models are also offered in kid’s sizing. Men’s sizes range from US 4 to 14. Women’s sizes, on the other hand, range from US 3 to 13. Both offer half sizes up to 11.5, and all are in Medium or Standard width. Some Puma Classics sneakers are built as unisex models in men’s sizing, including but not limited to the Puma California, Puma California East LA, Puma Suede Classic Pincord, and Puma Suede Classic MIJ. For this kind of Puma kicks, women are advised to order 1.5 sizes down from their usual size. There are classic Puma shoes like the Suede and Basket that often get upgraded into modernized women’s exclusive versions. Some examples are the Puma Suede Bow and the Puma Basket Heart Patent. Those based on basketball shoe silhouette feature sufficient reinforcements throughout the upper, hence allowing wearers the needed hold and support. Running-inspired Puma Classics shoes, on the other hand, are typically constructed minimally and with lightweight materials hence allow plenty of foot movement. Aside from their timeless and versatile aesthetics, one reason as to why Puma Classics sneakers are a crowd favorite is their affordable price point. A pair can easily be availed for as low as $55 – or even cheaper when discounted. Regular Classics could go as high as $100 to $120, depending on materials and technologies or release type. Collaborative Puma Classics shoes are typically released in limited quantities, which drive higher prices. Renowned designers or celebrities that took part in the design of these Puma Classics sneakers add value to such products. This is also one reason why this kind of releases gives some sort of a “hype” or a sense of exclusivity for the buyers. Some collaborative Puma Classics sneakers utilize upgraded materials in premium or superior quality than those used in their core shoe models. Hence, a higher price and better quality. Collaborative Puma Classics shoes are the kind of shoes that instantly make a great addition to a sneakerhead’s sneaker collection. One Puma shoe that defines the brand is the Suede. With 50 years on in production, its presence has been consistently strong since it initially released in 1968 as a low-top hoop shoe. Considered a revolutionary model at that time, it was the first basketball shoe to utilize suede as its upper material instead of leather and canvas which were the usual choice back then. Because of its on-point yet versatile style and impressive performance, the Suede was able to get out of the basketball scenery and expand its presence into the skate community and hip-hop culture. Today, the Puma Suede is marketed as a lifestyle sneaker model with countless iterations for both men and women. In this version, the timeless profile of the Puma Suede is updated with a prominent bow at the heel. The bow comes in tonal color as the upper but in a shiny and soft satin material for added oomph and feminine touch. The laces also received an upgrade. Instead of the usual flat cotton laces, these Puma Classics shoes use tonal elastic ones. This "Citi" version of the Puma Suede is inspired by the hustle and bustle of city living. It released in urban colors and only differ from the original Suede by its gum rubber outsole and metal aglets. These Puma Classics sneakers come in men’s sizing from US 4 to 14 in Standard width. It retails for $70. Released in Summer 2016 is another women’s Puma sneaker model based on the timeless silhouette of the Suede. These Puma Classics sneakers are dubbed officially as the elevated Platform of the Suede, all thanks to the elevated platform sole that does not only add a statement to the shoe’s already fashion-approved aesthetic, but also an added height and support for the ladies. The concept of "old meets new" smoothly applies to these Puma Classics sneakers. In this contemporary version, the timeless silhouette of the Suede received a subtle upgrade by transforming the leather Formstrip of the OG version into an embossed one for a fresh look that still stays true to the Suede’s athletic heritage. Recently released Puma Suede Classic Kurim is another addition to the long list of Puma Classics shoes. Another modern upgrade to the Suede, this version transformed the Formstrip into its rubberized form for an up-to-date look. Highlighting such updated feature, even more, is the tonal rubber sole unit and the entirely tonal suede upper. Released in 1971, the Puma Basket followed a classic Suede basketball shoe tooling. 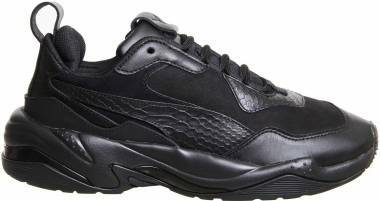 It features an all-leather low-top construction with an adjustable lace-up closure. It was merely just the leather counterpart of the other iconic Puma Classics sneakers - the Puma Suede Classic. Because of its sturdy leather upper, it quickly became a favorite winter hoop shoe among the Suede supporters. Released in September 2018, these Puma Classics sneakers feature an added chic bow detail at the heel. This modern rendition of the Puma Basket features elastic laces in lieu of traditional flat cotton material. The uppers of these retro Puma Classics shoes are made of durable leather material. The tongue, toe vamp, and Formstrip are made of suede. On the side panel is a Puma Basket branding in gold foil text. Additional Puma branding is on the tongue. This rendition of the iconic Basket is an epitome of the fusion between classic and luxury. 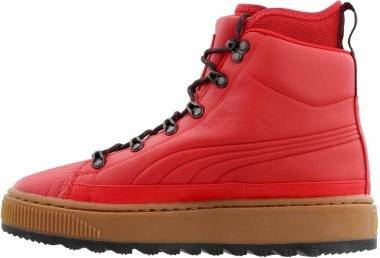 It is constructed with a full leather upper in a low-top construction and a lace-up closure system. Giving off a retro vibe is the gum rubber outsole with ribbed toe bumper for added protection. Unlike the Suede and the Basket, the Puma Breaker Leather can be considered as a “newcomer” as Puma only introduced it in 2017with the help of Big Sean. Although relatively new, the Breaker’s silhouette is based on classic court style with a bold look. It drew inspiration from the punk scene counterculture of New York and London during the ‘80s. These Puma Classics sneakers are made of an entirely knitted sock-like upper, which gives the shoe a slip-on construction for easy wearing and snug fit. 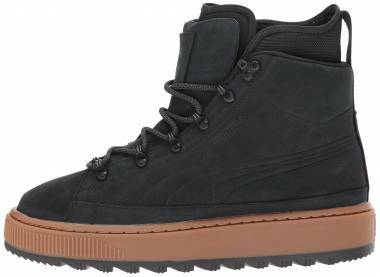 The side panels are constructed with premium nubuck material for added support. There is a hidden lacing system for a secure and comfortable fit. The rubber sole is slightly elevated. Joining the collection of basketball-inspired Puma sneakers is the Puma Breaker Suede Gum. Also based on the classic Suede tooling, it features a suede upper that sits atop a thick and textured gum rubber sole for that Breaker’s signature bold look. It is available in men’s sizing from US 4 to 14 in Medium width. One addition to the long list of slip-on Puma sneakers is this Mesh version of the Breaker silhouette. Its upper is predominantly made of mesh material in a sock-like bootie and slip-on construction. The side panels are of suede for added reinforcement and support. Also featured are adjustable rounded laces for a secure fit. The Roma is one of Puma’s first few running shoes that initially released in 1968. These Puma Classics sneakers are infused with features suited for sprints, hurdles, and other track and field activities. Like other Puma Classics sneakers, the Roma holds a distinct look given by its classic signature details. It flaunts a T-toe overlay, gold stamp callouts, Puma Jumping Cat logo on the heel, and gum rubber outsole. In 2008, Puma re-issued this classic silhouette through the “White/ Team Royal” colorway. The shoe features a clean leather upper with signature Formstrip reinforcement to the sides in suede material and original Puma gold sticker of authenticity from 1968. It dropped along with three other colorways that gave tribute to the Italia 68 football team. Available for both men and women, the Puma Roma Basic flaunts a retro athletic vibe that roots back to the ‘60s. Its myriad of colorways features varying upper material including leather, nubuck, synthetic, or canvas. It also features an EVA midsole for cushioned support, lace-up closure for a secure fit, and a rubber outsole with special tread pattern for superb traction. Another addition to a collection of retro Puma sneakers is the Puma Roma Gents. Taking a cue from the vintage look and original form of the ‘60s classic, this Roma rendition added a touch of luxe and sophistication by incorporating nubuck leather all throughout the upper. The substantial build of the shoe also comes with a prominent gum rubber toe cap for impact protection and a gum rubber outsole for superb traction. The Puma Roma Gents first released on April 13, 2017, in two colorways: "Red/Black" and "Black/Yellow." One vital part of the Puma legacy is the Clyde shoe. It was basketball icon Walt "Clyde" Frazier's signature basketball shoe that Puma specifically designed for him in 1973. It is the lighter and broader version of the Puma Suede with a Clyde branding on lateral sides. Retailing for $75, this recent rendition of the timeless Clyde shoe surely gives any Puma follower some sense of excitement and a must-have attitude. As the name suggests, these Puma Classics sneakers are straight from the archive and follow the original ‘70s hoop shoe designed by no other than Walt "Clyde" Frazier. The Clyde from the Archive exhibits an all-over suede upper presented in a color-blocked design. Featured for added protection is a textured rubber midsole. The lace-up closure in flat cotton laces allows a snug and adjustable fit. These Puma Classics sneakers are made in men’s sizing in Medium width. Combining classic looks with modern materials is not entirely a new thing in sneaker releases, but somehow this rendition of the hoop-inspired classic Clyde managed to stand out from the crowd. The Clyde Rubber Toe Leather is not your ordinary kind of modern sneaker. It has this athletic yet sophisticated aesthetic that you can easily strut from day to night. A durable leather material dominates the upper for that premium look. On the toe is a prominent rubber reinforcement inspired by skate shoes for that street-ready vibe. In 2018, the Clyde has received a premium makeover through the Puma Clyde Venice sneakers. This version is the luxe suede modern interpretation of the iconic basketball-turned-lifestyle shoe. It released in men’s sizing for $80 a pair. The upper is made of luxe suede material in fresh, California-inspired colors. The adjustable cotton laces are tonal. On the lateral heel area is debossed palm tree detailing. The heel features a multicolored pixelated pattern instead of Puma's Jumping Cat logo. One crucial part of sneaker culture is sneaker collaborations. 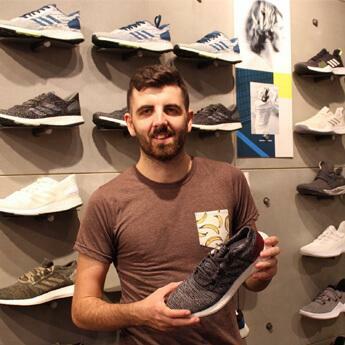 Sneaker brands often collaborate with renowned designers, artists, celebrities, popular sneaker retail shops, or other fashion brands in creating a whole new look for their classic sneaker models. These partnerships result in special releases that, more often than not, create hype or buzz in the sneaker community. These red Puma sneakers are released in commemoration of the Suede's 50th anniversary. First made available on June 7, 2018, via select retailers, the SF Suede 50 immediately sold out. It features a red suede upper with an F-1 inspired carbon fiber black Formstrip and Modena yellow Ferrari branding on the heel. These Puma Classics shoes are motorsport-inspired. It flaunts a mesh upper with caging at the laces, IGNITE foam sockliner for responsive comfort, and rubber outsole for grip. Finishing the look of the Puma Ferrari Changer Ignite is a Ferrari Shield logo at lateral side heel. Also referred to as the Puma Scuderia Ferrari Roma, these collaborative Puma Classics sneakers are released in several colorways in men's sizing. The upper is made of leather with a sufficiently padded tongue for comfort. Also featured are a leather Formstrip and a Ferrari branding at lateral side heel. This collaborative sneaker fuses the classic profile of the BOG with BAPE’s contemporary design. 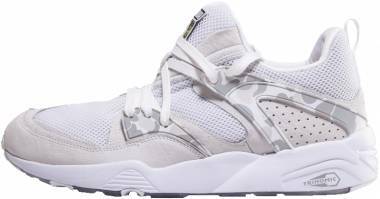 A great addition to anyone’s collection of white sneakers, this shoe features a leather upper with mesh underlays, EVA midsole, and Puma’s Trinomic technology. The Puma x BAPE Blaze of Glory released on December 12, 2015, along with other Puma silhouettes such as Disc Blaze and R698. One common signature feature of these shoes is BAPE's ape head camouflage print detailing. Are Puma sneakers in the Classics collection more expensive than regular ones? As discussed above, Puma Classics sneakers are generally budget-friendly. A pair costs about $55 to $120, depending on the materials or technologies utilized. Collaborative Puma Classics sneakers, on the other hand, are priced slightly higher than their regular versions. How do Puma Classics shoes fit? Guide on Puma Classics sneakers' fit and sizing are also discussed above. Like any other sneaker, these shoes vary in fit and sizing depending on the material, built, and shoe model. Keep in mind, however, that user reviews and our Fit and Sizing section in individual sneaker review pages provide a general idea on how a specific Puma Classics sneakers fit. Is the Puma Classics collection limited to old Puma models? No. The Puma Classics collection also includes recently released Puma silhouettes that drew inspirations from one or more classic Puma models from the ’60s, ‘70s, ’80s, or ‘90s era. Examples include the Puma El Rey and Puma Redon Move. 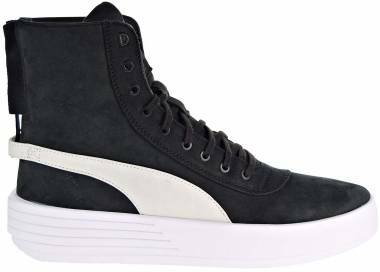 Also, most releases are new Puma sneaker models that are based on Puma classic silhouettes like the Suede, Basket, Turin, Roma, California, and Clyde, among many others. Some of these Puma Classics sneakers feature latest footwear technologies. What are these technologies? IGNITE foam – a midsole technology made of polyurethane (PU) foam instead of EVA. It helps in impact protection while providing excellent energy return. IMEVA foam cushioning– Otherwise known as Injection Molded EVA; gives a lightweight and comfortable ride. evoKNIT – upper technology that offers a lightweight and form-fitting comfort. Are this kind of Puma shoes available in women’s sizing? Which Classics are built with mid-top and high-top construction? What is the proper way to clean my Puma Classics sneakers? Cleaning Puma sneakers, including those in the Classics collection, depends on their materials. Leather Puma Classics sneakers should be cleaned by using a soft cloth dampened with mild soap and cold water. Same goes for those that utilize canvas or nylon. Gently scrub the shoe using a dampened soft cloth. Air dry only. For synthetic leather, nubuck, and suede: Use a soft brush and other suitable cleaning materials like a suede cleaner (or mild soap for synthetic leather).